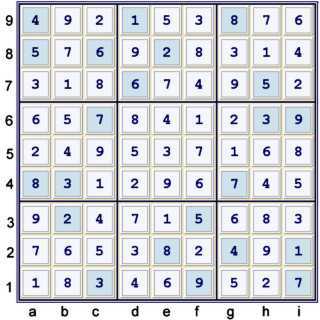 The following is a partially illustrated solution for the sudoku.com.au tough puzzle of 01/15/08. I found this particular tough puzzle to be somewhat vexing. 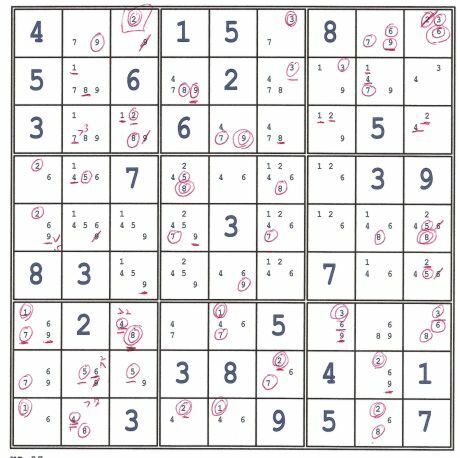 Hopefully, some of the Sudoku tips,tricks and strategies used in this solution will be helpful. I believe some of the steps that I found are at least interesting. A few more easy steps are available, but not required in this solution path and thus not illustrated. I think a less deep solution than the one that follows is possible. 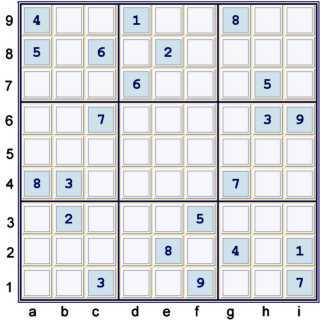 However, for really tough puzzles the following published steps may be more instructive. Hopefully! It is nice to use the Hidden pair qualities and the naked pair qualities of an Almost Unique Rectangle in the same chain. One needs to think clearly, though. Note that at least one of 14 cannot exist at c45 if only 14 exist at h45. (9)e7=(9-8)d8=(8-5)d6=(5)b6-(5=6)b2-(6=1)a1-(1)a3=(1-7)e3=(7)e7 => all weak links are sis. 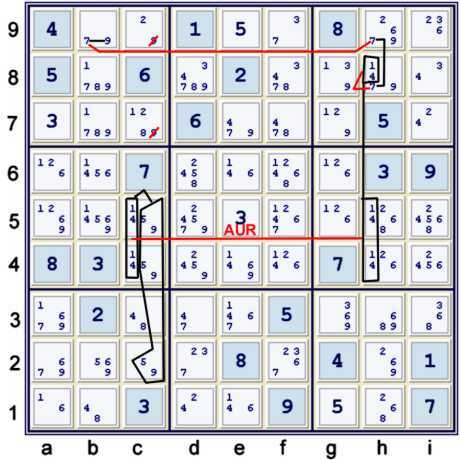 Note a target exists (9)e7. 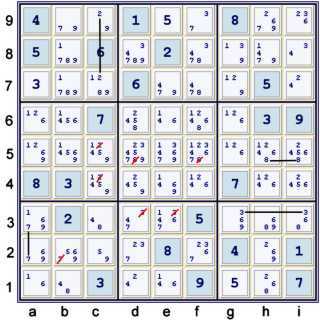 Place (7)e7, (9)g7 into result column (-2) total(0) done. The resultant BTM (Block Triangular Matrix) can be made into a simple Triangular matrix, however, this is not required. However, merely counting allows one to not traverse the same chain segments mutliple times. Also, counting need never anticipate an intitial target. Although this latter representation loses the AIC quality of the deduction, it is more faithful to the typical AUR conclusions. 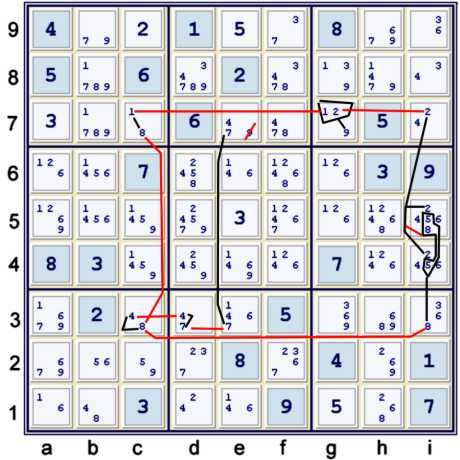 Regardless of how one chooses to think about it, (1)g5=(1)g6 => g78,h45≠1 reduces the puzzle to naked singles to the end. Certainly, a less deep solution path is possible. This probably could reduce the rating. 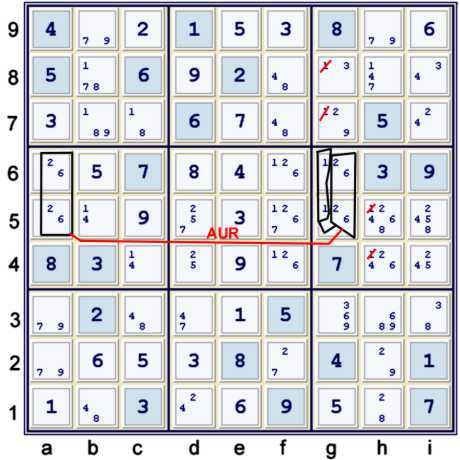 This particular puzzle has many AUR type deductions possible. It also has many chains available that do not use uniqueness of solution. The solution provided above is primarily meant to illustrate one path available using relatively simple concepts combined in what I find to be interesting ways. Very nice for your proof, especially step 4b...! I would love to see your proof, regardless of length. I thought that my solution left was not quite as good as it could be. I called this solution a solution, rather than a proof. This is because I used uniqueness in the posted solution. Thus, I do not have a proof of unique solution, but rather only a solution path. I'm studying how you can present chains as your step 4b above, that step can present as Triple Chains or Cell Forcing Chain (in SE) but in one chain... I must be study & try more... again. Once again thank you very much for your works!